Belonging is our most important value, and we strive to cultivate a community where everyone feels welcome. We also like to have a good time and we are always looking for ways to give back to our community. Throughout the year we offer social, community service and philanthropic opportunities to both members and non-members. Check our events calendar for what we have coming up next! This event is sold out, but we invite you to workout for FREE all day on March 8th at City Gym. March 8th is International Women's Day. This year, this date has been designated as a day to offer support and participation in the #DayWithoutAWoman strike. As a woman-owned business, this day is quite personal to us. We know the tremendous financial and human impact that women have on our community. Rather than closing or striking on March 8th, we have decided to take action by receiving and supporting women (striking and non-striking) by providing them an opportunity for self care and to be in community with like-minded individuals. We invite ALL WOMEN to a FREE, sweaty and empowering strength class, led by Hailee Bland-Walsh, City Gym Owner/Founder. This class is open to the public, but REQUIRES a ticket. Parking is tight at City Gym on Wednesday nights (we have a rear lot). Please allow time to find parking in the surrounding neighborhood should our lot be full. Please arrive at least 15 minutes early to check in and complete the City Gym waiver. This waiver is event specific, so City Gym members will need to allow time for check in. We encourage you to bring a water bottle. The water fountains can become crowded with a workout this large. Wear RED! Women around the world will be wearing RED in honor of #ADayWithoutAWoman. If you cannot make the class, please cancel your ticket so that someone from the waitlist may take your place. We want as many women as possible to take part in this event. 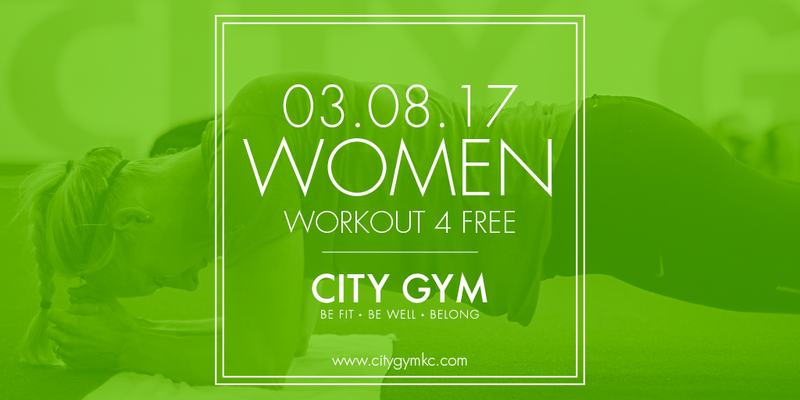 On March 8th, City Gym invites ALL women to workout for free. This includes our group exercise classes, but City Gym members who have registered online will receive priority. Guests will be allowed to fill open spots on a first-come, first-served basis. For the greatest chance of getting into a City Gym group class, arrive 20 minutes prior to class and add your name to the class sign-in sheet. All guests MUST present a photo ID and complete a liability waiver. Lockers are available, but you must bring your own lock. On March 8th and EVERY other day, City Gym welcomes and celebrates the diversity of gender expressions and identities of women. We stand with our trans and gender non-conforming community members and invite you to our #DayWithoutAWomanWorkout and #WomenWorkout4Free events.